#3 face in the "29 Faces in May" challenge. "Little Feather" is a young native american boy with a feather, medicine pouch, and beaded costume. 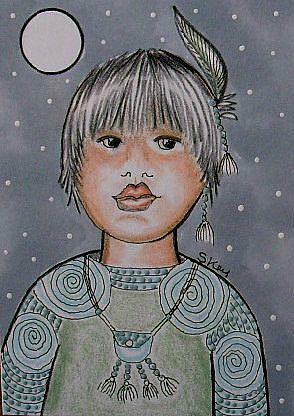 Colored pencils, mixed media, 2.5" x 3.5" ACEO art card done in soft grays and muted greens.